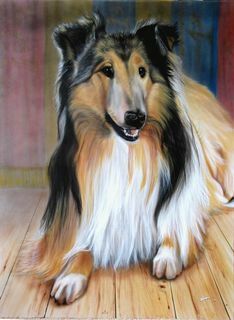 My Father had two Collies dogs which he used to Show in the 1960's. For some time I have wanted to do a portrait of his favourite (Sandy of Mulloch, common name Scott, nicknamed Puckell). I secretly airbrushed this for my parents, now in their mid 80's, for Xmas 2010. They were thrilled and amazed at the accuracy of his colours and markings. Bailey was a lovely little cat and was with a dear friend for 18 years but she went to the cat place in the sky last year. 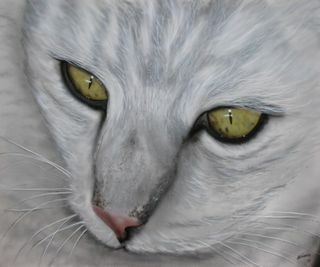 Her Human had a photo on the fridge so I borrowed it and did this 600mm x 400mm airbrush painting on canvas board for a Xmas present 2010. Long time friends of mine, Wendy and Sku have been married for 27 years and during that time have been the Staff for 5 cats. Wendys Birthday was coming up and Sku asked me to re-unite all the cats.